AUSTIN, Texas--(BUSINESS WIRE)--CarStory, Vast’s automotive AI platform, today announced that its CarStory Market Reports for used vehicles are available to all Ford and Lincoln dealers with a FordDirect website at no charge. This partnership provides Ford and Lincoln dealers with the opportunity to tap into CarStory's proprietary vehicle and market analytics tool to help price and market used vehicles. CarStory Market Reports use advanced AI and analytics to best position used vehicles in local markets to sell. Using the industry's largest set of inventory and shopper insights, Market Reports are the most advanced way for dealers to connect visitors with the vehicles they want. Analyzing shopper behavior and the local market, CarStory provides used vehicle information to help buyers to make purchase decisions. Over 10,000 franchise and independent dealers, including OEMs and automotive marketplaces currently use Market Reports. By adopting this tool, FordDirect joins Volkswagen, Hyundai and others in taking the next step to enhance the online vehicle shopping experience. For more information, or to sign up, please visit: carstory.ai/ford-direct. 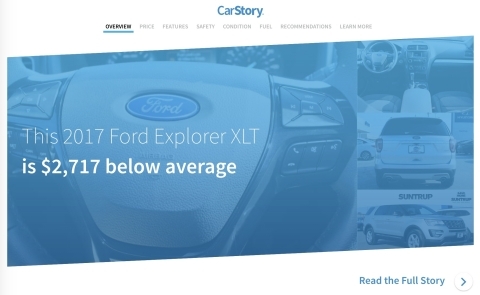 Powered by the industry’s largest database of inventory and shopper insights, CarStory uses artificial intelligence (AI) and machine learning to help both consumers and dealers make confident decisions. With a network of over 10,000 dealers nationwide, and touching over 15 million consumers a month, CarStory is the leading automotive analytics platform in the industry.